It’s been very dry throughout much of the whitetail’s range so far during antler growing season. For example it was the second driest May since records have been kept in Arkansas, fourth in Kansas, seventh in Missouri, and eleventh in Oklahoma. N.O.A.A has been keeping records 118 years. It has been very dry during the growing season in these states. These rankings are based on statewide averages. 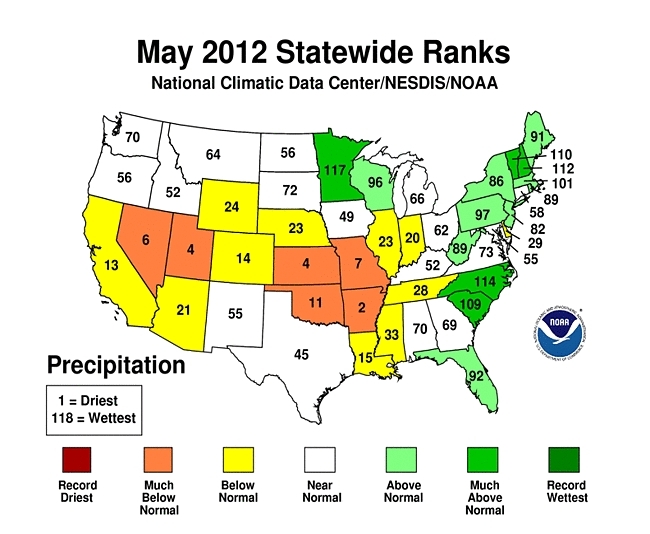 I think it is drier at my place (just a few miles from Arkansas) than the Missouri average indicates. Likewise, I’m sure some areas in these states have received an isolated thunderstorm or two and aren’t as dry as indicated by these statewide averages. Plants need water to transport nutrients from the soil and air into and throughout the plant. Without adequate moisture, plants are simply not as nutritious compared to more normal growing conditions. Remember plants are simply transfer agents and if plants are lacking nutrients, so are the critters that consume them. Deer in drought areas won’t produce as large of antlers or as many (or healthy) fawns compared to the same deer during better growing conditions (different years). Therefore droughts have a huge impact on hunters deciding on where (which state or region) to go hunting and deer herd managers deciding on whether to harvest bucks during drought years. I use maps to plan where to hunt and data from N.O.A.A can be a very valuable scouting tool! Is the primary goal of planning an out of state hunt is to chase deer with larger antlers than what’s typically produced near your home? Then studying the N.O.A.A. data and determining the severity and duration of droughts can be just as important as studying the average antler size from specific counties, etc. For example, planning a deer hunt in Kansas might not yield the expected results if that area is experiencing one of the worst growing season droughts during the past 100+ years. This is always dependent on the local conditions. For example, if you were planning to hunt near an irrigated soybean or alfalfa field, the drought might make the hunting better! The local herd had access to quality forage and all the deer in the neighborhood will likely be feeding at the irrigated crop versus spread out in the drought stricken native vegetation. For deer managers that manage and hunt the same deer from birth through maturity, droughts may cause a different decision. Consider if you and your guests have passed bucks waiting for them to express 90+% of their antler growth potential. These bucks reach 4.5 years of age during an extreme drought. Due to a lack of quality forage, those mature bucks only express a portion of their antler growth potential – maybe not as much as they did when they were 3.5 years of age. The manager then has to decide if he and his guests will attempt to harvest the bucks even though they are only expressing a portion of their antler growth potential. This is a personal choice – one that should be based on the reason you/the landowner hunts. Personally, I enjoy the challenge of hunting mature bucks and does. Given the extreme drought conditions at my place this year, I will focus on harvesting enough does to balance the amount of food available during these poor conditions. They will likely return again. During years with better growing seasons, each deer will have ample food to produce the best antlers and fawns they can. I will also attempt to harvest a mature buck. I enjoy large antlers as much as most hunters. However, my primary satisfaction is being able to pattern and harvest a mature buck. My guests and I will only harvest a small portion of the mature bucks that our years of management efforts have yielded. I realize now that bucks will not express their full antler potential this fall. However, they will still be just as alert and skilled at avoiding predators (2 and 4 legged). The hunt will still score as much to me as if I was hunting during a year with average or better growing conditions. I hope the growing conditions are good where you hunt. If not, I hope you still enjoy the hunt!